Klunkung is one of the smallest regencies of Bali. Belonging to this regency are the small islands of Nusa Penida and Nusa Lembongan in front of Bali. 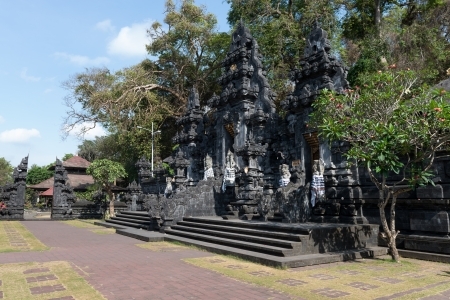 It was in this part of Bali that the fleeing royalty of Majapahit dynasty set up their kingdom. Between the 14th and 19th centuries Samprangan, Gelgel & Klungkung were all capitals of the Klungkung regency. Recognized by other Balinese kingdoms as the most powerful, this regency was one of the last strongholds of the Balinese during the Dutch invasion of 1900´s. The Gelgel dynasty ruled in Bali for over 600 years and throughout their reign the arts flourished. This busy market town on the main road to Besakih and Amlapura is steeped in history and has some noteworthy sites, the Semara Pura Palace complex which houses the Hall of Justice and Kambang Pavillion. The market here sells interesting textiles woven in the Eastern part of Bali. Another thing to buy here is sea salt panned from the nearby beaches. 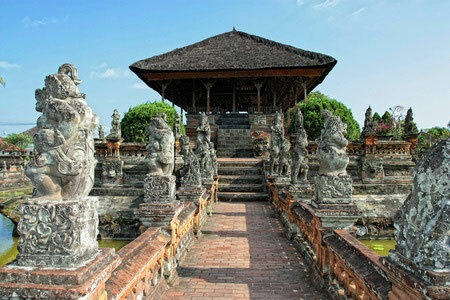 This palace has been built in the Dewa Agung dynasty, by artisans of the royal court. Not much remains of this palace, destroyed during the Dutch invasion of Bali, except for the main gate and two buildings that were rebuilt and restored in the 1940´s. Judgement Hall. Kertah Gosa is a hall of Justice which functioned as the highest seat arbitration in the kingdom. The ceiling friezes depict scenes of horror and punishment. Villains judged here were imprisoned on Nusa Penida Island. This floating pavilion is adjoined to the Judgement Hall, the ceiling friezes here depict scenes of Buddhist folklore and astrology. A cave said to house the scared serpent that guards holy Mount Agung and the cosmos. Teeming with bats, this cave has various passageways, some up to 30 kilometer long, in fact it is said that one leads all the way to the temple of Besakih. The royal household was based in the village Gelgel in the 15th century. Both the Jero Agung and Dasar temples are worth visiting, the latter being reserved for ceremonies of higher caste or aristocracy of Bali. A small village near Klungkung from which a style of Balinese painting originated, the Kamasan style, based on east Javanese shadow puppets or wayang. This village is also famous for its gold and silver smiths who make hand beaten bowls and trays used in religious ceremonies all over the island. Kusamba is a salt panning village with a black sand beach. 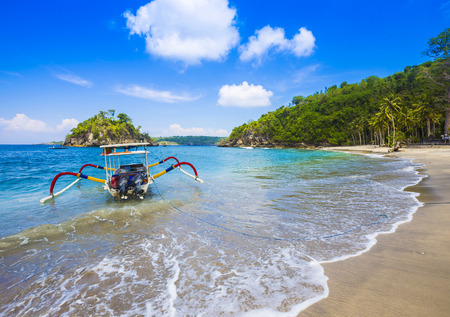 Small islands of the East coast of Bali, with a number of caves and beaches to explore. Lembongan is a very popular one-day cruise destination. Paksa is a village famous for re-enactments of ancestral battles. The participants re-enact these battles while they are in a trance. Originally is this the penitentiary island for the Klungkung kingdom. The Dalem Peed Temple is associated with myth and black magic. Tropical coastline of Nusa Penida island. This is largest of the three outlying islands measuring approximately 200sq kilometers. White sand beaches, white cliffs prove that this island is not volcanic but made mainly from limestone. Historically, Nusa Penida was a penal colony for the Klungkung Regency, undesirables were sent here after having been judged in the Kerta Gosa. A very dry climate and a local myth of a ferocious giant, giving Penida a reputation as an evil place, maintain the population at about 45000. For the most part Penidan families fish and farm for a living, with seaweed being probably the largest export of the island. The main town is Samplan, on the North East coast of the island, this and another 18 hamlets make up the extent of the residential part of Penida. Two temples, Peed & Batukuning are interesting to visit. The dive spots on Penida are very challenging as currents are strong. Nusa Lembongan is a small low-lying island of approximately 2.5kilometers wide with 4 kilometers in length. This island has white sand beaches, crystal clear waters, coral reefs and is currently developing as a promising tourist destination. Cruise operators visit this island with diving, snorkling, class bottom and banana boat rides being the main focus of tourist attention. The main industry here is seaweed farming and the seaweed gardens are well worth visiting low tide. A unique place to visit on the island is an underground house which was supposedly carved out of the ground with a spoon. Other attractions include walking around traditional village and catching a small boat to tour the mangroves. Surfers all head over to Jungut Batu on the North East part of the island. The smallest of the three islands, made up mainly from a sand flat. 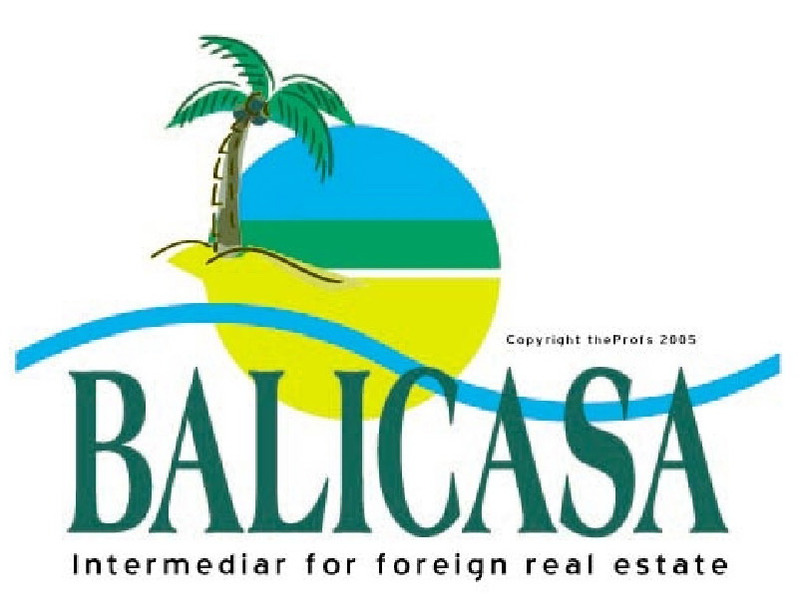 The name comes from cenik - the Balinese word for small. Seldom visited the small islet is home to a bat cave, incredible coral and marine life. In the area of Tukad Unda there are rafting recreation activities. The length of the rafting is about 9 kilometers and at this rafting band you will meet about 22 barricades.